The students of activities in the Faculty of Pharmacy and Drug Manufacturing held a seminar entitled ” Law of Attraction” on Tuesday 25/10/2016. The seminar was given by Mr. Ahmed Gomaa, the Human Development Specialist in the presence of faculty members, teaching assistance staff, along with a number of students. The students of activities took some photos with the keynote speaker and the staff members for memory’s sake. 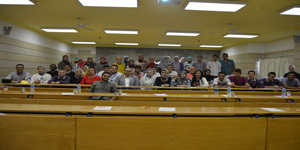 The seminar was under the supervision of Dr. Hesham Nematallah, the leader of activities in the Faculty.